Most of us are familiar with trampolines as a fun addition to your back yard, designed for bouncing on. Nowadays, many people even use rebounder training as a way of keeping fit and healthy. However, did you know that some people actually use them as trampoline beds? No, really! Although you wouldn't sleep on one night after night, big trampoline beds are a really fun way to enjoy camping with your family in your own back yard. There are several variants such as trampoline swings. 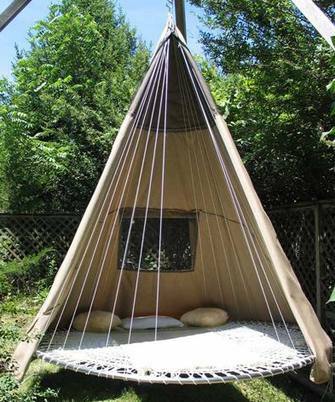 Also, you can even learn how to make a repurposed trampoline hammock yourself. Whether you want a hanging option or to get an add-on to your existing trampoline, there are lots of choices available to you. So, would a trampoline bed be a fun addition to your garden? Read on for our handy guide! What is a trampoline bed? Are trampoline beds good for dogs? Trampoline bed DIY - How to make a trampoline bed? How much are trampoline beds? In essence, any trampoline big enough to fit a person on lying down can be a trampoline bed. However, as you can imagine, sleeping on a trampoline can be pretty chilly. Therefore, trampoline beds usually include some kind of tent to keep out the wind and rain. Also, this provides the extra warmth you need to be able to sleep on the bed overnight. Many trampoline manufacturers are savvy to this new trend and sell tents or 'clubhouses' that can be fitted to your specific trampoline. If you already have a trampoline, check out Amazon to see if your model has a specific tent accessory that can be integrated into your trampoline. However, if you haven't purchased your trampoline yet but want to be able to sleep on it, check before you buy to make sure that there are tents or clubhouses available for the model you want. On the other hand, if you have a trampoline from a company that doesn't sell these add-ons, don't worry. Or, you may not want to splash out on a specially-built model as they can be pricey. It's still perfectly possible to make a DIY option so that your family can enjoy camping out on your trampoline. We'll explain the steps required later in the article. 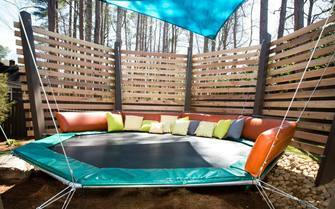 These trampoline beds mean that you or your kids can use them to lounge around on or have outdoor sleepovers. However, remember that the weight limit of your trampoline will still apply, even if you're not actually bouncing on it! 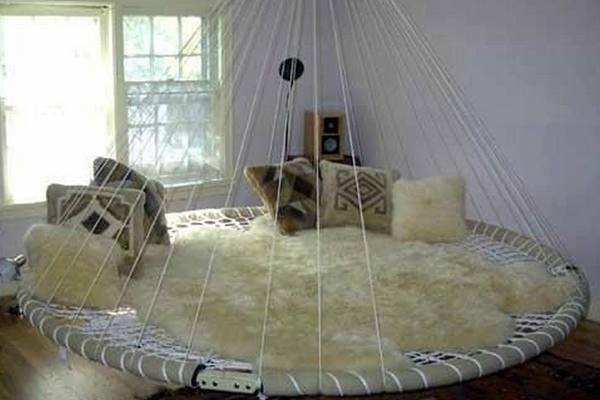 However, another option is a hanging trampoline bed. These can be great fun and can look very attractive, although they are a DIY option. You will need to have an existing trampoline that you don't mind repurposing. Also, bear in mind that a hanging trampoline bed will no longer be suitable for jumping on. 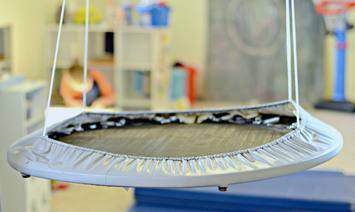 As trampolines have a lot of 'give', they will be more comfortable than just sleeping on the ground. However, if you want to get a good night's sleep, there are things you can do to make your trampoline bed as comfy as possible. Try adding a mattress topper to the jumping mat and including plenty of cosy blankets, pillows and quilts. Not only will this make your trampoline comfier to sleep on, but it will also help to keep you warm. Even in hot weather, it can still feel pretty chilly at night. Pretty much any trampoline that's designed for jumping can also be used for sleeping, as long as it is big enough. Of course, a rebounder will not work as a trampoline bed. However, please remember to remove any tent or canopy used for sleeping before jumping on your trampoline. You need to have clear space above your trampoline before you bounce, or it can be dangerous. Also, jumping up and hitting the tent can damage it, which is a particular problem id you have invested in an expensive model. Remember to remind your kids that there should be no big bounces while they are using it as a bed. However, if you opt for one of the hanging options like we mention below, these are not suitable for jumping on. Of course, you'll want to discourage your kids from bouncing on a regular bed, as it can damage both the mattress and the bed frame. We also don't recommend using a trampoline as a bed long-term. That's because you need adequate support for your joints and spine during sleep, which a trampoline won't provide. However, it's perfectly fine to sleep on a trampoline every now and then, as long as you don't have any painful joint conditions. Of course, setting up a trampoline bed in a bedroom is not as straightforward as in your yard, unless the room is extremely large. However, some parents may be keen to set one up in their kid's bedroom for sleepovers. That's because most parents would not want young children sleeping outside with their friends on a trampoline without constant supervision. The main issue with setting up a trampoline bed in a bedroom is space. However, some of the oval 2-person play trampolines would fit in most bedrooms and could be used as a bed for sleepovers by small children. The good thing about this option is you don't need to worry about waterproofing or keeping the bed warn enough. Hanging sheets or blankets over your trampoline to make a canopy and adding bedding are all that's required. This gives your kids the experience of camping on a trampoline without any of the risk. Some people have even repurposed old trampolines as permanent bed frames, for a quirky addition to bedroom decor. Is the tent warm and waterproof? You'll want to be sure that your kids are adequately protected from the elements when they're sleeping outside. This is not an issue if you set it up inside. How will you make sure they are supervised? Only you can decide if your kids are old and responsible enough to sleep outside alone safely without an adult. For young children you'll probably want to either supervise them all night yourself, or have them come inside when it gets dark. Again, this can be solved by setting up indoors. What about toilet trips? As any parent will tell you, some young children need toilet visits in the night. Take this into consideration before letting your kids sleep outside on a trampoline. They allow the air to circulate: As your dog is raised off the floor, they won't overheat in hot weather. This is especially useful if you have an elderly or very fluffy pet. They keep dry: If you're taking your pet camping, this is a great option, as it keeps them raised off the wet ground. They are more sanitary: Traditional pet beds can grow parasites and bacteria more easily, posing a risk to your pet. Making your own trampoline bed is a great option for those who can't find a canopy to fit their existing trampoline, or who don't want to shell out on an expensive cover. You will, however, need a bit of DIY know-how to pull off this project. The easiest way to do this if you only want a temporary bed for your kids to use if to use a waterproof cover like a tarpaulin at use it to cover your trampoline using the enclosure poles. Of course, you will then need to make your bed comfy using bedding. 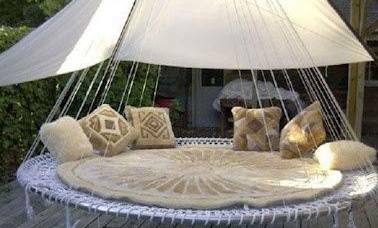 Another great option is to make a hanging trampoline bed. However, remember that these types of bed are not suitable for bouncing of any kind. To create a hanging trampoline bed, there are several steps you'll need to take. 1. Remove the legs from your trampoline. 2. Decide where you will hang it. Please make sure that whatever you use is strong enough to support the weight of both the trampoline and anyone sleeping in it. A strong, tall tree or a wooden beam are good options. ​3. Using heavy-duty hooks and strong ropes, tie ropes at several points around the outer frame of the trampoline and then attach them to your tree or beam. Measure carefully and ensure the bed is level. ​4. If you want your bed to be warm and waterproof, you'll need a cover. A tarpaulin, a repurposed regular tent or any other type of waterproof material can be used. 5. Add a mattress topper and bedding to make your bed comfy to sleep on. If this sounds like an awful lot of work, you can buy hanging camping beds online that are much more expensive but require no DIY skills. If you are short on space or don't have a full-size trampoline that you want to put to a different use, then you can follow the steps above using a rebounder that you are no longer using. 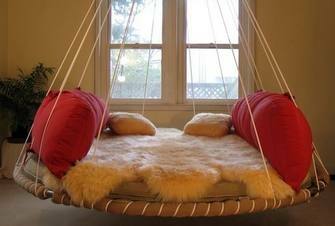 While this will be too small to sleep on, it can make a great swing, chair or somewhere for kids to hang out. Bear in mind that the result will have a lower weight limit. As we mentioned above, a simple option is to purchase a tent, canopy or 'clubhouse' specially designed to integrate with your existing trampoline. You can often track these down on Amazon or via your manufacturer's website. Please remember you will need to find one designed to fit your model. Also, if you want to save a bit of money, it may be worth keeping an eye on second-hand sites. This all depends on the size, brand and model of your trampoline. However, most types of trampoline tent or 'clubhouse' retail at around $100 or less. If you're going for a DIY option, then it will probably work out a little cheaper. The materials required such as strong ropes, hooks and a waterproof layer such as a tarpaulin are all reasonably cheap to buy. You may even have some of the materials you need hanging around in your shed already. However, if you are planning on installing a special frame or beam to hang a trampoline hammock from, this can push the cost considerably higher. As you can see, trampoline beds or a trampoline swing can be a great addition to your back yard or even to a bedroom. There are lots of options available, and which you choose depends on how much space you have available and how hot your DIY skills are. Also, you must take into consideration whether you want to completely repurpose your trampoline, and whether you still want to be able to bounce on it. If your DIY abilities are up to scratch, you can even follow the steps in our article to create your own repurposed trampoline hammock. In the end, sleeping on big trampoline beds is great fun for kids, and can provide the perfect place to hang out and let their imaginations run wild.